I turned to hook and yarn to provide a last minute birthday present for the little boy next door on his first brithday. I decided to use a pattern, since I was in a hurry, and selected the Ugly Duckling from my large folder of favorite free patterns. It seemed perfect. It was cute, it looked quick, it was - 11 inches tall? Oh, too much. Bigger than I wanted, and it would take sooo much longer than I had thought it would. I sighed (wasn? I going to use someone ELSE? pattern for once? ), pulled the picture of the Ugly Duckling up on my monitor, went to the sofa, and crocheted one of my own design that was smaller. My friend gave me to understand that this little guy was a big hit with her little guy. 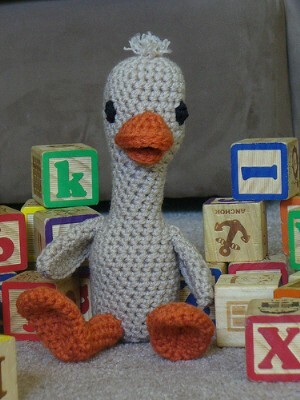 Without further ado, may I present the Smaller Ugly Duckling, for your quick and last minute waterfowl crocheting pleasure?